It’s simple: The best solo camping hammock ever made, including the best suspension system. Leave your underquilt at home on warmer trips by utilizing the NX’s insulating pockets. This is a US-made, 4-season hammock that will never let you down. Rugged, reliable and complete. The NX series is the ultimate tent hammock. Backpacker Magazine named the NX-270 a “best new hammock”, praising its spaciousness, “excellent livability” and insulating properties (See the review). In addition, the NX-270 includes the finest suspension available anywhere including the highest grade Spectra slings, Timp-Hitch attachment point installed on the hammock, and adjustable tree protection straps that make suspending your hammock easier and faster than ever. You will stay dry, bug-free and perfectly comfortable in this American-made system. The NX-270 is ready for a wide range of temperatures. The insulating pockets allow you to leave your pad or underquilt at home down into the 30s F (around 0° C). 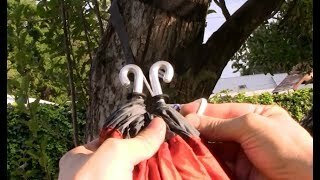 These insulating pockets are accessed through zippers inside the tent hammock. Organize and store gear in these pockets to help the pockets insulate even better. When temperatures drop further, velcro is built in around the bed to accommodate our Z-Liner 270 underquilt. 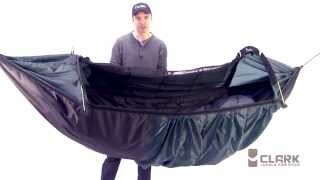 The breathable WeatherShield zips in to transform the hammock into an enclosed tent, providing warmth, a wind break, or extra protection from rain and snow. The NX-270 combines a large solo bed with flexible poles to create a spacious feeling and easy set-up. Simply connect the hammock to two supports, insert the poles, and you are ready for a comfortable sleep. A dedicated cell phone pocket and a two-ended pocket (which can hold anything from a water bottle to a pistol) complete the interior storage. You will notice the quality of the craftsmanship right way. Each hammock is made in our Salt Lake factory from the best materials. Every bed is made from US fabric that is woven to provide breathability, water repellency and mosquito resistance. Should I buy the NX or TX model? The NX series is intended for backpackers who will usually be camping in nighttime temperatures between 35 degrees F and 65 degrees F (2 – 18 C). In these temperatures, the insulating pockets allow you to avoid bringing a pad or underquilt. The WeatherShield (the breathable cover that zips over the netting) is standard on the NX models. The TX models are intended for people who plan to camp in nighttime temperatures above 60 degrees F (15 C). The TX is especially for humid and hot climates. The storage pockets are spread apart to allow you to feel cooling breezes and the head end has extra air circulation provided by the netted hood. If you purchase the TX model with the WeatherShield option added, using a pad or underquilt makes it fully winterized. Love the quality and features of the hammock! Fits me well, warm at nights, flexible for nearly any weather! The best hammock I’ve ever had. Spent the last three years in mine and completely changes backpacking all together. Waking up in the morning and your back is not killing you like laying in a tent, or pouring down rain and laying comfortably above the wet ground. I have owned an NX since 2013 and i must admit that without this jewel all my camping and my two times in BC would have never been so comfortable. Definitely love the Clark hammock! I purchased a Clark NX in May of 2016. That hammock became my home for the next nine months. Sleeping in the hammock nightly was not by any means a step down from a traditional bed. The mountains of Oregon and Northern California became my turf during that time. I hung that hammock in some very novel and scenic places, camping illegally, the entire time. Setting up camp in total darkness, mostly by feel was a necessity in these situations. The Clark hammock made this quite a simple task. I even weathered a category two hurricane that battered Northern California and Southern Oregon for six days, in comfort. I was able to strike camp in one hundred mile an hour winds and torrential downpours, in total darkness with relative ease. I laughed at the howling winds that sent other less adventurous campers scurrying to hotels and shelters like whipped pups. Yes, nothing in the advertisements put forth by your company turned out to be hyperbolic in nature. If anthing, they proved to be understated. In my opinion, I can state with confidence, that no other customer.has placed your product under greater stress than I. If they have, I doubt that they survived to tell the tale. My story will definitely be told as I am in the process of writing a book about my adventures. I’m writing because my (military) teammate has one that was passed down to him and we all fell in love with it and this is why, During one of our missions in the desert we got hit by a sandstorm in the middle of the night and he was the only one out of our 8 man platoon that had your hammock and survived through the night without losing any sleep. Meanwhile, the rest of us suffered in our garbage personal tents that let all the sand in that completely covered us from head to toe including our weapons and gear. Then we woke up to freezing temperatures covered in sand to walk out into a hail storm to try and fix our flimsy tents that we got issued by the military. 4 of the 7 tents were completely ruined and inoperable afterwards. Your product literally survived the test of nature without a scratch. You’ve convinced 8 of us that your product works and we would love to pass it on to the rest of our community and other elite communities alike. Whether I’m sleeping in sleet in Illinois, mosquitoes in Wisconsin or ticks in Missouri my Clark hammock has provided exemplary comfort and protection while sleeping. I keep telling my friends about it about it! They’re great! Will never sleep another night on the ground! Maybe above the tree line but should have a boulder or two to tie to, LOL. Perfect for my next trip to Coyote Lake!! Had mine about 7 years now and LOVE IT!! My NX has served me well, especially for winter outings. I’ve fitted my 0 degree underquilt and I stay toasty warm. The weathershield affords just enough windbreak and can be vented to allow vapor to escape. My Clark has accompanied me through very cold nights in the woods and has kept me quite comfortable! Went up into the upper peninsula of Michigan and had a weekend in the wilderness. Sleeping in a hammock is better than a tent, especially if you have a quality hammock like a Clark. Similar to another reviewer, this hammock changed backpacking for me forever. If you live in an area where trees are not an issue, I can’t think of a single reason to choose a tent over this hammock for a solo hiker. The most striking difference is how much better sleep I get in the NX-270. The price/weight/ease of set up are comparable, but the comfort, versatility, and storage are far superior than the solo tent I used before buying this hammock. I’ve had it for a season now, using it many times, and I’m ashamed to admit I feel a little superior to my fellow hikers who use tents/shelters (especially in bad weather.) Quite simply, I love this hammock. The only thing I can’t vouch for yet is durability, but I don’t anticipate a problem here (although I wouldn’t care if it was.) It’s than good. I’ve been using my Jungle Hammock for the last 4 years while hiking sections of the Appalachian Trail, I can only go out for 5-8 day trips at a time, I find myself literally not getting up as early as I did when tenting to break camp because I’m so comfortable in this thing, no kidding! I’m up to 1500 miles and used this for the last 500 miles, I wish I had it for the first 1000 miles. I’ve owned my NX-150 SINCE 2012 and while I was sure I made the right choice I can honestly say that I may never own another brand of hammock. I put it to the test and it worked beyond my expectations. In my first winter trip it definitely proved its worth. Temps in the single digits and 40mph winds, but with my pockets filled with extra clothes and a 20° UQ I was toasty all night. The weather shield worked really well in helping to trap heat and block the wind. I love the fact that the poles created enough space as to not feel cramped or claustrophobic. My next purchase will be the NX-270 next year and I’m looking forward to the same quality and comfort from it as I get from my NX-150. Awesome hammock. Love it. Never slept so good out in the woods. Easy to set up and gets you off the cold ground. Under quilt is a dream in cold weather. A must for trout fishing in the Adirondacks. My first Clark Hammock I ever bought was the North American model and I used it during my 2012 thru-hike of the Appalachian Trail. I used it the whole 2,184.2 miles of the trial and loved it the whole way. Several of the other hikers that were out there as well ended up ditching their tents and getting a Clark Hammock themselves once they saw and tried mine out. I have since owned the NX-200, a couple of the NX-250s, the Vertex Ultra, and the NX-270. I refuse to use any other hammock because I don’t feel that any others can compare to the quality and comfort that a Clark provides. I will always be a loyal Clark user. Thanks for continuing to make such great products. I bowhunt and the Clark NX has proven it’s bulletproof and warm for my solo Colorado adventures. Absolutely a must for the hunter who desires mobility and ease of set-up. Best hammock around. Our family has owed several hammocks through the years and none compare to the versatility of the Clark. Well made and extremely dependable. We enjoy a lot of backpacking camp outs. The NX series has keep us warm and dry at all times. Highly recommend these hammocks. My first Clark Hammock showed up in the Fall of 2001. In 2018, I decided I wasn’t going to outlive it, so I gave it to my son and bought a new NX-270. The original American still looks virtually new. Both have now been to near zero at 7,500′ elevation, through heavy wind and rain, a little snow and hail. There is no stopping Clark Jungle Hammocks! In warmer months, I backpack with only the hammock and a light inflatable pad, sometimes a light fleece blanket. No tarp or quilt, and I’m perfectly fine down to the 40s/50s evenings here in the mountains and high desert. For winter in the NX-270, I added an insulated Klymit pad and a thin sheet of mylar under that, and 0-degree top quilt. It’s a little heavy for backpacking, but so very worth it. my absolute favorite among the bunch i own, including two from two different cottage vendors. this is the hammock i always end up bringing on trips. it is just the most comfortable in all weather conditions. i’ve used it in the tropics, mountains, winter, summer and it never disappoints. just an all around great hammock that is very well made and if taken care of, will last for years. i personally know this because i also own the NX 250 (only difference being that it doesn’t have the inside zippered access to the storage pockets) and it is still running strong, net and all. thank you clark! you make a great hammock. I’ve been down to -15 in my NX 270 with just a insulated klymit and extra gear in the pockets. By far the best hammock around. Love my NX. Did the first 400 miles of the AT. last year. Starting at Skyline hiking north on the AT for a few months!!!! By far the best 4 season Hammock!!! Download the comparison charts below (pdf files) by clicking on the links. If you do not have Adobe Reader, please visit www.adobe.com.